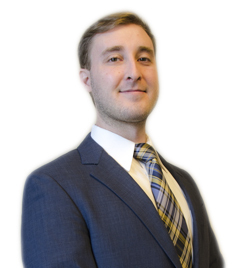 Michael Crane is an Associate Attorney with Latorre Law Firm. His practice areas focus on Personal Injury and Workers’ Compensation Law. Michael is an aggressive advocate who stresses fair compensation for all injured clients. Michael received his Juris Doctorate from Marquette University Law School in 2014. While attending Marquette University Law School, he was a member of the pro-bono honor society, Intellectual Property Law Review, and Moot Court Appellate Advocacy team, as both a competitor and coach. He worked as a law clerk for a local firm and interned with the Milwaukee County Civil Court. After graduation Michael worked as an associate attorney for a general practitioner, taking cases in a variety of areas, including personal injury, family, and criminal law. He has performed consulting, policy generation, and structured compliance policies for local school organizations. In addition, he has worked with the Innocence Project to exonerate a man wrongfully convicted of murder. Michael is licensed to practice law in Wisconsin and is an active member of the Wisconsin State Bar.